*blink* *blink* Basic Grey at Big Lots?!?! I am NOT even kidding you! I know, you wanna’ Elaine-from-Seinfeld me, right? You wanna’ push me really hard and say, “GET. OUT!” But I am SO serial. I of course first heard about this from The Peas. I think they were a wee bit excited, since they talked about it HERE, HERE, and HERE. Yeah, no less than THREE threads in a week about “Basic Grey at Big Lots!!!!! !” We Peas have lost our ever lovin’ minds over this. Okay, do you remember how MY Big Lots pretty much *sux*? The whole Thickers thing really soured me. We got, like, 5 packs total that were alphas (as opposed to the shapes which I have less than zero use for). I tried and tried and tried. Scrappers from all over the US of A were finding them at their Big Lots, I think for $1 or $2 per pack. But noooooo … not me. Not the Biggest Thickuh Luvah Evah. I couldn’t find any for months and when I finally did, they were, well, meh. I mean, I bought them of course because we’re talkin’ THICKERS here, people! But it was anticlimactic at best. So when I heard the online screams of “Basic Grey at Big Lots!! !” … I was, like, “Yeah, whatevs.” I figured I’d check if I were ever in that area of town for something else but I wasn’t going to make a fool of myself and stalk BL like I did for the Thickers. Okay, well, and the cheap Cricut cartridges. What’s that saying? “Fool me once, shame on you. Fool me twice, shame on me.” I’m nobody’s sucker. So I did burn rubber over to Big Lots in search of BG. It was more like a leisurely stroll. I restrained myself for, oh, a whole day before I manufactured a reason … erm … remembered something I really really really needed in the same mall as Big Lots, and then I finally went. You’re never going to guess: I hit the jackpot! 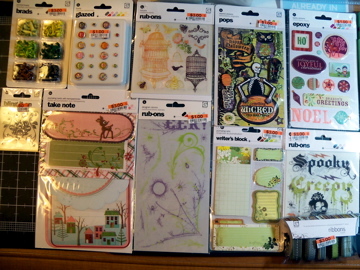 Not only did my BL have the BG, I got some other cute things, too. I know you’re only here for the eye candy and not my wicked frickin’ wit, so here ya go … PICTURES! I didn’t want to make you wait another day so you have to deal with the bad lighting because I took these pics Tuesday night. For YOU. 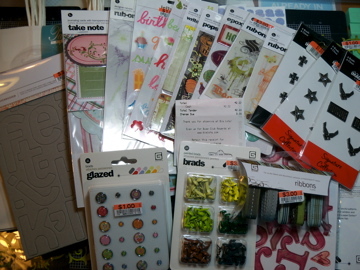 My entire Big Lots haul for 42 dollahs, baby! 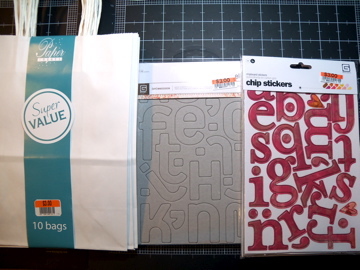 White gift bags which I love for wrapping gifts cuz I get creative with the ribbons and tags; only 30 cents a bag. 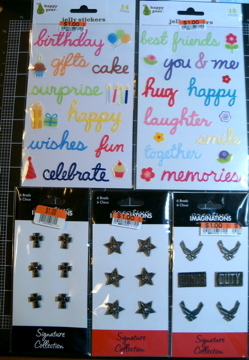 Basic Grey rub-ons, painted brads, glazed brads, pops, epoxy, writer’s block, take note, ribbon, and bling it on – various lines. That’s a lot of scrap crap for only $42, huh? I was quite happy with my purchase. It’s been a while since I’ve scored like this. I was due. Am I right? I also have some Michaels photos for next time … the cute new Spring stuff they have on the shelves, and the 2 Cricut cartridges I got for $9.99 each from last week’s big sale. Thanks so much for the heads up at Big Lots. They just opened one around teh corner from me, I’ll have to check it out. Wow..SCORE!!! I’m gonna have to check my Big Lots asap…I usually don’t find anything good at my store either, hopefully that will change! GAH! You enabler you! Lolzz, now I need to check my BL.. Thanks for sharing – I’ve got to tell my friend that we need to go to BL today! OH NOOOOOOOOOOOO! 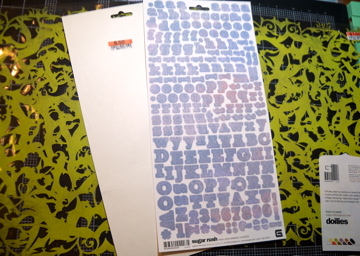 Now I MUST MUST MUST check out the new Big Lots near me! LOL I have held off, but if there’s a chance I’ll score me some BG…. I’m headin’ over there tmrw AM right after my morning walk… oh wait… maybe I’ll forgo my walk… no, I can’t… I’ll go after. LOL :-) Thanks for the tip!